Eine aktuellere und Smartphoneoptimierte Seite mit den Büchern von Marc Dibowski finden Sie auf der Webseite zum Buch "Wunder zu verkaufen!" im Shop, inklusive Direktdownload. On this small website you will find some of my magicbooks for download. Wunder zu verkaufen! Marketing für (Zauber-)Künstler. Tischzauberei - das Buch (Marc Dibowski) - german language only. Deutsche Version Weihnachtszauber - KLICK! As reviewed with **** in MAGIC, VANISH MAGIC MAGAZINE, MAGIE and LINKING RING and highly recommended by Bill Abbott, Chris Capehart and more Pros. Download as an (e-)Book! Download Instantly! 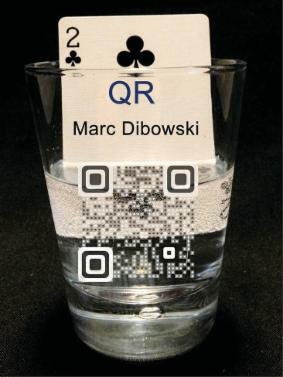 In this brandnew magicbook, Marc Dibowski, author of some bestselling magic books in germany, shares ideas and effects for a magic act in the holiday season. This is Dibowskis first book in the englisch language. And it´s a hit! Add a touch of winter and christmas to your kids show, stand-up, mental or close-up act. In addition to ideas on props, you will also find in "Christmas Magic" routines and ways to tailor your act for christmas without large expenses, without adding loads of new props, without laborious efforts. Find effects for parlour, stage and close-up. Find ideas to get a christmassy touch on your regular show. Marc gives you ideas for props, and also routines designed to build in a Christmas theme without having to spend weeks designing a complete new magic show. 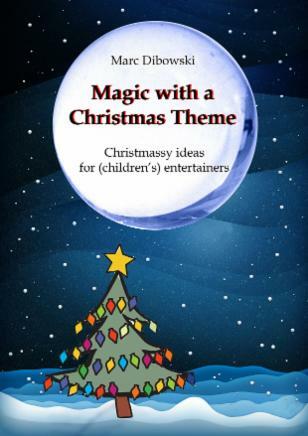 Find ideas for your adult and kid-shows.The book is completed with informations on Christmas characters, links to marketed effects including sources and information on Christmas traditions in different countries. You will find ideas and routines for a family audience, childrens shows and, adults as well as close-up-routines, stand-up- and mentalism-routines and a lot of gags for performances in the holiday season. Find christmas magic tricks and ideas. You WILL use some of these ideas ...! FIND OUT MORE! Click the tabs on top. 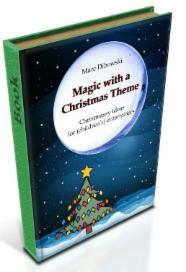 Press the button or click here to buy the Christmas Magic e-Book! Buy it directly from the author - and get updates or additions for free in the future! You will get the book instantly as a PDF. Pay with Paypal Download with Sellfy, no registration! Das Buch mit einer Vielzahl an Ideen für ein weihnachtliches Zauberprogramm. Sowohl für Kinderprogramme, als auch für den Erwachsenenbereich finden Sie eine Menge brauchbarer Infos, Tipps und Routinen für ein Weihnachtszauberprogramm. Please note that magic lives with the secret. So the books are non-returnable. Thank you for understanding.